Gargano is a historical and geographical Italian sub-region situated in Apulia, consisting of a wide isolated mountain massif made of highland and several peaks and forming the backbone of the Gargano Promontory projecting into the Adriatic Sea. The high point is Monte Calvo at 1,065 m (3,494 ft). 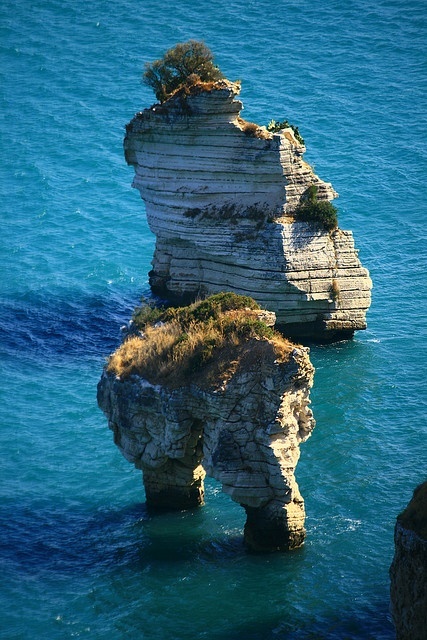 Most of the upland area, about 1,200 km2 (460 sq mi), is part of the Gargano National park, founded in 1991. It is within the Italian Province of Foggia. The Gargano peninsula is partly covered by the remains of an ancient forest, Foresta Umbra, the only remaining part in Italy of the ancient oak and beech forest that once covered much of Central Europe as well as the Apennine deciduous montane forests biome.